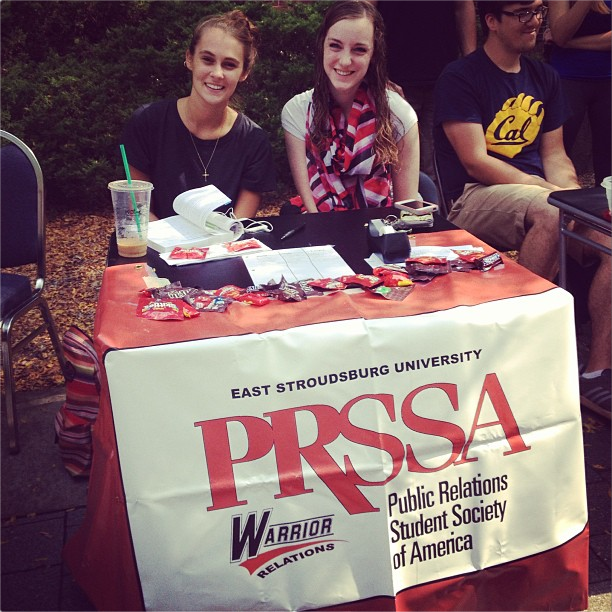 East Stroudsburg, PA – October 2, 2013 – On Tuesday, September 10, 2013, ESU’s Public Relation Student Society of America chapter participated in the annual club fair hosted by Student Senate. PRSSA was amongst over 60 other clubs and organizations that setup a table and provided information to students and faculty. The club fair allowed PRSSA to interact with members of other clubs, speak to potential members from a wide array of majors and interests about PRSSA’s mission, and inform old members of new meeting times and open e-board positions. The club fair proved to be a successful platform for networking and recruitment, as many of the students that stopped by the PRSSA table requested more information and/or attended the first open meeting that was held that afternoon. For more information, please contact Avery Gardner (adg2130@live.esu.edu).